Do you remember the We Heart Books activity I shared with you earlier this week? Here is a picture of the bulletin board we created just outside our classroom (we actually displayed our work across two bulletin boards - this is just one of them). Do you remember that I promised you I would share the writing prompt sheet we used for it? Well, I went one step further. I created a whole FREEBIE file just for you! This file contains instructions, a sample of the art activity, the writing prompt instruction sheet with link to the website for creating the hearts, and a student example. And you don't have to wait until Valentine's Day next year to use this activity - the LOVE of reading is something you can celebrate at any time of the year. Just click HERE or on the picture below to download your own copy. I hope you enjoy! Thank you! I love the reading response in the heart shape. I can't wait to do this with my students. That is a very cool idea of a reading response in a heart shape! Thank you for sharing this. this will be sooo perfect for Nevada Reading Week!!!!! Many thanks!! I have a very artistic bunch this year and they will LOVE the art integration! GREAT idea! I love it :) Thank you for sharing. I have printed it out and it is in my Valentine folder for next year. When we did the "line over hands" in October, I thought of you! I should have known you already had that art idea in your repertoire. You were the star of our temperature word problems the other day. I think my California kiddos think you live in Antarctica! Turned out great! I love the heart art. 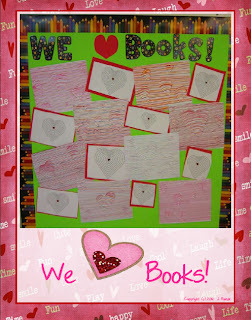 We used the festisite hearts in our kidblog this week, too! Big hit. I love the heart art! I'm thinking I might try it with shamrocks since I didn't get to use this for Valentine's Day! Thanks for the festisite link too. Your BB turned out great! Thanks for the Freebie!